Almost square at the halt. Best of all, I was able to maintain contact. Christy put us to work tonight on some easy patterns, so I could start working on timing and polishing our many rough edges while also getting back into shape. As we walked, she reminded to me to move “hips to hands” rather than bringing my hands back toward my hips. “Hips to hands” creates following contact. “Hands to hips” constrains. Moving into the trot, Derby felt pretty good and we got to work doing a simple pattern consisting of a 20m circle on the long side and then changing rein across the diagonal. 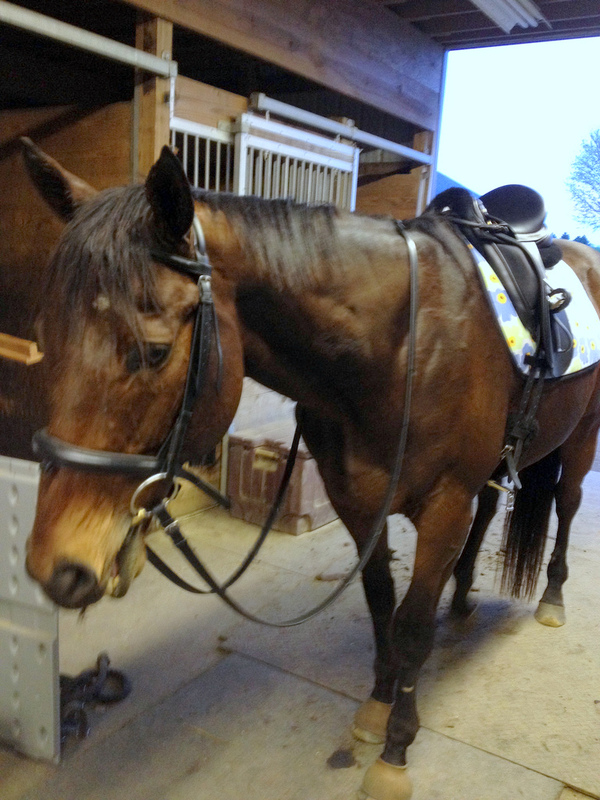 It’s a good exercise and revealed some weaknesses on my part – I need to work on those trot diagonals. My indecision about when to change my diagonal is reflected when Derby starts to wriggle and stray off the diagonal. I’m trying to change from immediately changing my diagonal to doing so as I go into the corner after my diagonal is complete, so I can concentrate on generating a solid trot across the court. Old habits die hard. This will take some work. 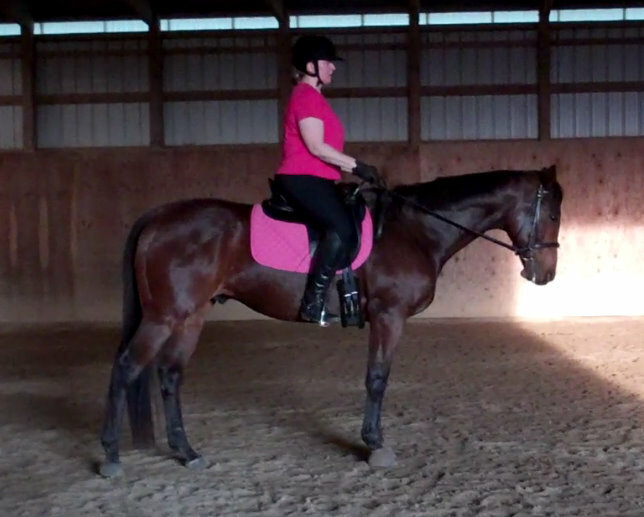 I also need to work on changing diagonal standing, which Derby appreciates. He's uphill on the circle. I'm surprised we weren't serenaded by an angelic chorus. The 20m circles were pretty good. I’ve been working with Derby on responding quickly and correctly on the ground when I ask him to step over. and I cue him by giving him a very gentle poke low on his barrel, where my spur would touch him. When I’m on a circle and Christy tells me to get that inside hind underneath, I’m able to get a quick response. The quality of our circles is getting better. The next pattern Christy assigned was a flat figure 8, bisected by the centerline, and requiring a tighter turn onto/off the centerline at each end. She also had me throw in a halt for good measure. This exercise really made me use my half halts – in the corners, on the turns, and into the halts. This exercise revealed that I need to really work on engaging Derby’s hind legs. Connection is essential to executing the more precise turns and the ensuing halt. And to have good connection, you need a good trot. And to get a good trot, you have to have those hind legs in gear. 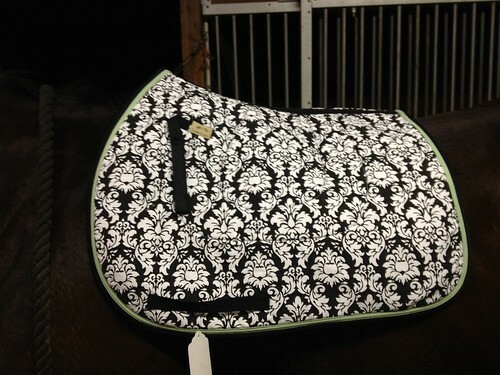 This pattern was a great exercise and I was pretty happy with how I’m riding, stamina aside. I do need to keep improving my reaction times, catching Derby before he hollows, bulges a shoulder or gets strung out behind. 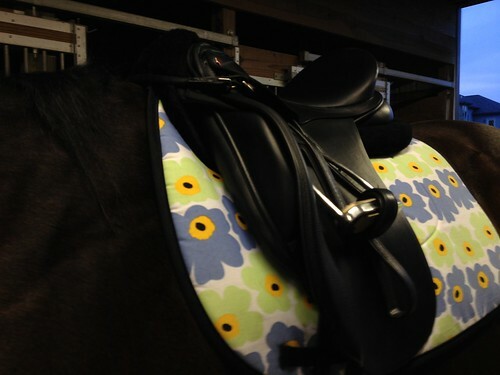 But that timing and feel will come back with more time in the saddle. After we were done, we walked outside and strolled around the outdoor arena to cool down. It was a beautiful evening, so our little hack was followed by a quick shower and some grazing. Derby was, once again, a total star. It looks like we’re going to go to a schooling show at the beginning of May, and then another toward the end of the month, to get some more show miles on Derbs. I will be riding Intro at the first and very likely the second – we don’t have a canter at the moment to speak of at the moment. We’ll start putting that together again next week but strength is an issue at the moment. Getting out at training still remains a goal for this summer. I finally had a lesson tonight after this long hiatus, and it went really well. Christy was pleased with my posture, and Derby clearly felt good and was moving very nicely. 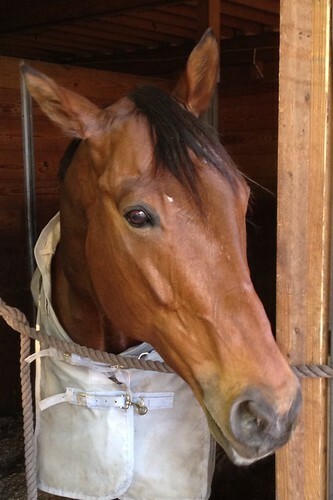 We’re only going for 30 minute rides this week – Derby has been off for a while and his fitness has suffered. 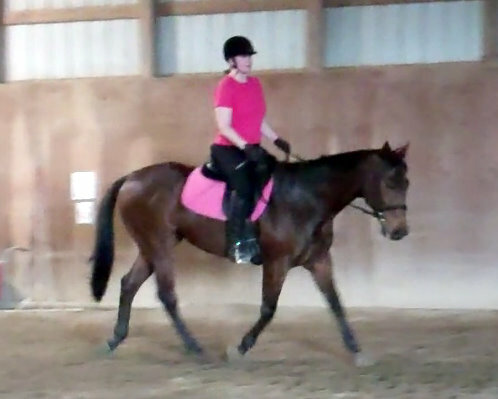 We’ve got to get his top line back, so that will mean lots of trot work and transitions. We had a nice, swingy walk to start, and all of my buttons were working, though I did have to work a bit to get his left hind under him. Christy told me to “Tuck that leg underneath him, do a turn on the forehand if you have to,” and that totally did the trick. 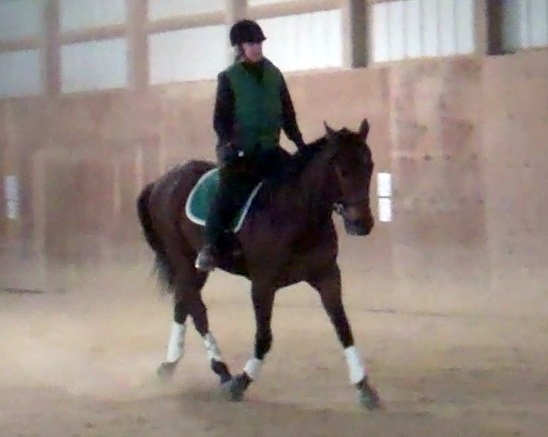 Moving into the trot, I was pleased that I was staying balanced with my leg still. With some coaching from Christy (half halts – must remember half halts) we got it put together and had some very respectable quality work with some good working trot and with a little bit of more collected work thrown in. It was one of those nights it would have been very easy to over-do things. The horse felt great, the evening was warm and breezy, but I kept an eye on the clock. I know from past experience that the best way to get back into regular work is to focus on building fitness gradually. I’m doing a series of these 30 minute lessons this week, and next week (hopefully) we’ll jump to 45 minutes, and hopefully start adding the canter back in once he gets a bit stronger. The consensus from the boss was that we looked pretty much as we had when we left off, which was a real relief to me. We were doing some nice work before the new year, and I hope we can get back to that point pretty quickly. Today’s ride was really solid, on a number of different levels. I did a make up lesson with Christy, after temperatures near zero put a stop to lessons on Thursday, and we picked up where we left off – building my strength in my new position and starting to apply the aids. Derby felt great today, but it took some coaching from Christy to get me to ride him more back to front, with a better connection. I started the day by going in a nose-poking-out stretchy frame that looked like a baby green hunter. To establish a better connection, I need to first and foremost get Derby’s back end activated and engaged. Getting him through and working from behind is a real weakness of mine, and it’s something I must fix. The good news is that my lower leg was steady throughout the ride. I feel like I can crack coconuts with my new-found inner thigh strength! Okay,I exaggerate, but in just a week I’ve gained a lot of strength in this area, which is a big help. So back to the issue du jour, working from behind. Christy had us do an exercise at the trot which simply entailed talking the quarterlines, and then leg yielding toward the wall. My first few attempts were totally ineffective. Then Chrisy had me do a little shoulders-in to get Derbs into the outside rein, and reminded me that quality bend was also required. Better prepared on our next try, we got a few little steps, and then a few more. 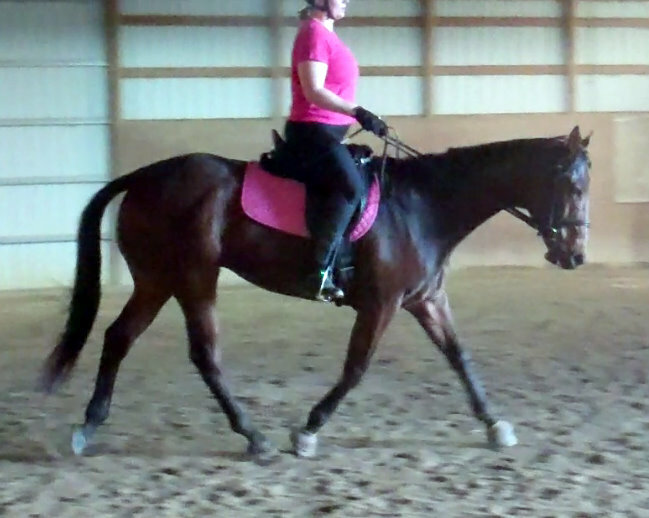 And as we schooled this exercise, the trot started to feel stronger and more powerful. The quality improved tremendously. The key take away for me today was pretty straightforward – I need to deliberately ride the movements, and if I don’t get the response I am asking for from the horse, I have to fix it, now. I’ll be focusing on hind end engagement in the near term. Life will be easier when Derby and I improve these skills. Overall, though, I was happy with this ride. Everything – our contact, our trot quality, my leg, quality of bend, the works – was a bit better today. After I rode, I watched Christy ride Liam. I swear, I learn as much watching her on the ground as I do in lessons. Liam had been off for a few days, and Christy wasn’t happy with the quality of the trot she was getting. She deliberately worked on isolating and moving his hind legs, and once she established that control, the gait quality significantly better. Watching her ride, and seeing how she used leg yields and other movements to activate Liam’s hind legs – and then witnessing the subsequent improvement in the gaits – really solidified my lesson in my mind.